I think it should be obvious from the sign if there are urinals in the bathroom. Maybe a picture of a urinal? will there be a changing room? Could be an issue for trauma survivors. 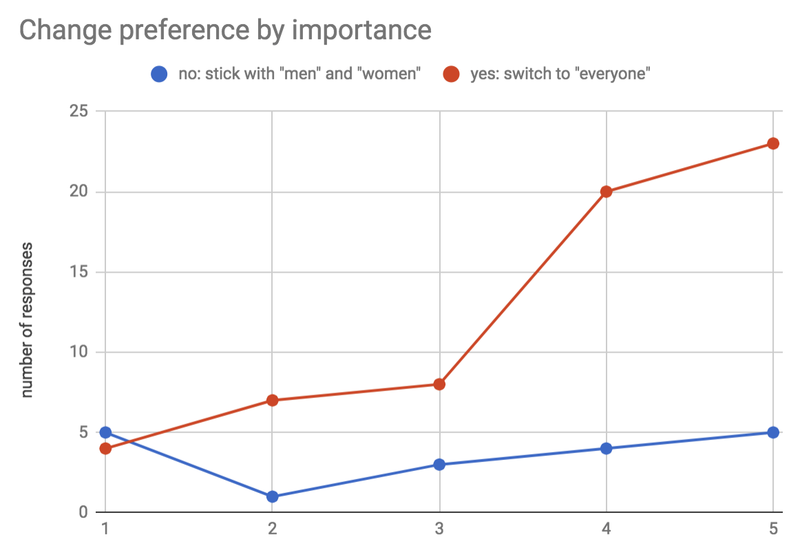 Maybe switch between M/F and everyone every hour? The facilities aren't set up to accomodate opposite biology, so it could be awkward. Current accommodation makes it clear which room for which "equipment" while also informing everyone cis and not that they're welcome. I am ok with anyone identifying as female, but guys are often messy. Depends. I am happy to change but I would not change unless you have a single user restroom. People whose cultural or religious beliefs, for instance, say that sharing with the other gender is not ok also deserve to feel comfortable (and not worry about going to hell, even though I personally have no such belief). However, as the bathrooms are currently designed the change seems problematical. There are two urinals in the men's room and one stall. If all the facilities were stalls it wouldn't be an issue. If women are fine seeing men's penises then go for it. It would make my NB friends more comfortable, therefore I support it. I like notation that says "with urinals" and "stalls"
This dance has gotten better and better and more inclusive-feeling since switching to gender-neutral calling! While I am generally in favor of fewer things being gendered I recognize that there are significant concerns that some people might have with genderless restrooms. As someone who sits I do know that many of those who stand fail to aim. I value a dry and clean seat. If you switch I will cease to use the toilets here, instead going home for the night at first need. Sorry, but that's the way it is. I feel more comfortable being around other men when in the bathroom. 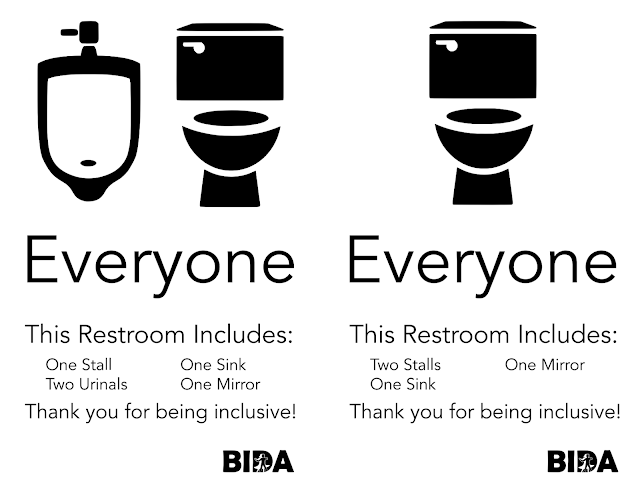 Instead of "everyone" maybe just label the bathrooms "urinals" and "no urinals". I don't think the urinals are useful to everyone. By all means go to "everyone" if you have interest in that! If it will make others able / more into dancing it's worth it. Maybe it would also be good to have a discussion at this point about where people should and shouldn't change their clothes, as this may be on folks minds and may also be the thing keeping the more timid from saying "let's make them both 'everyone'"
The bathrooms are also used for changing clothes and one can change without waiting for a stall. Having it mixed use would change that, creating even more of a wait than there already is now. Transgender can already (and should) use whichever bathroom's gender they identify with. We haven't decided yet what we're going to do; we'll decide that at our next board meeting, in June.